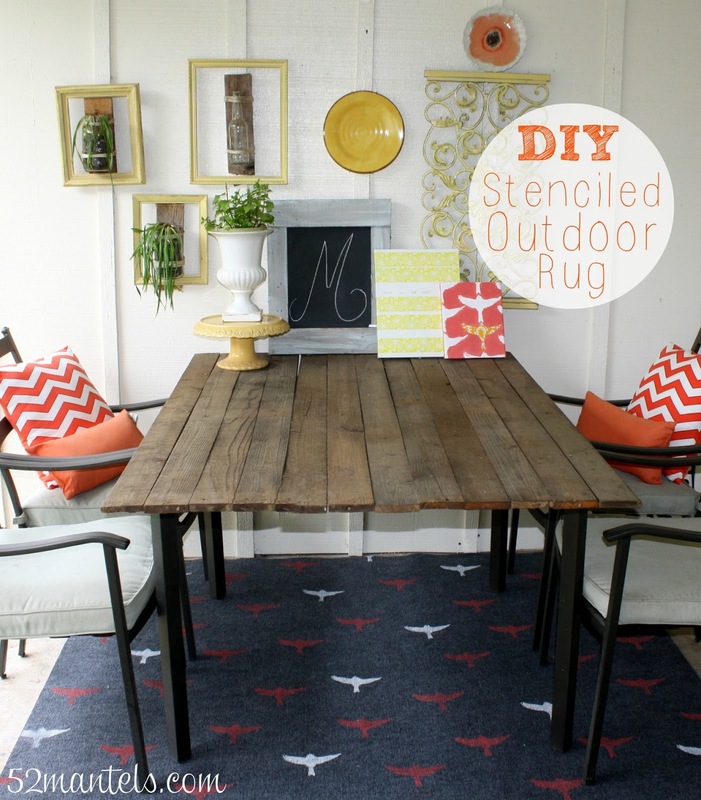 Have you ever stenciled a rug? I tried my hand at it last week and am loving my newly stenciled outdoor rug! Next week I'm sharing a wall stencil I tried out for Cutting Edge Stencils (stay tuned!). When I received my supplies in the mail, this sweet little bird stencil was in the packaging. Perhaps he was a fun bonus? Or, maybe just mistakenly placed in my box? Either way, I was happy to try him out on a $20 outdoor rug from Home Depot. I painted my 6x9' rug inside, on my 3x4' kitchen table. It was challenging. Obviously, a large flat surface would be more ideal. I wanted my pattern random, so I started in one corner and worked across and down. On each section, I stenciled a flock of coral birds, washed my stencil and stenciled a few white birds. The stencil cleans so easily! 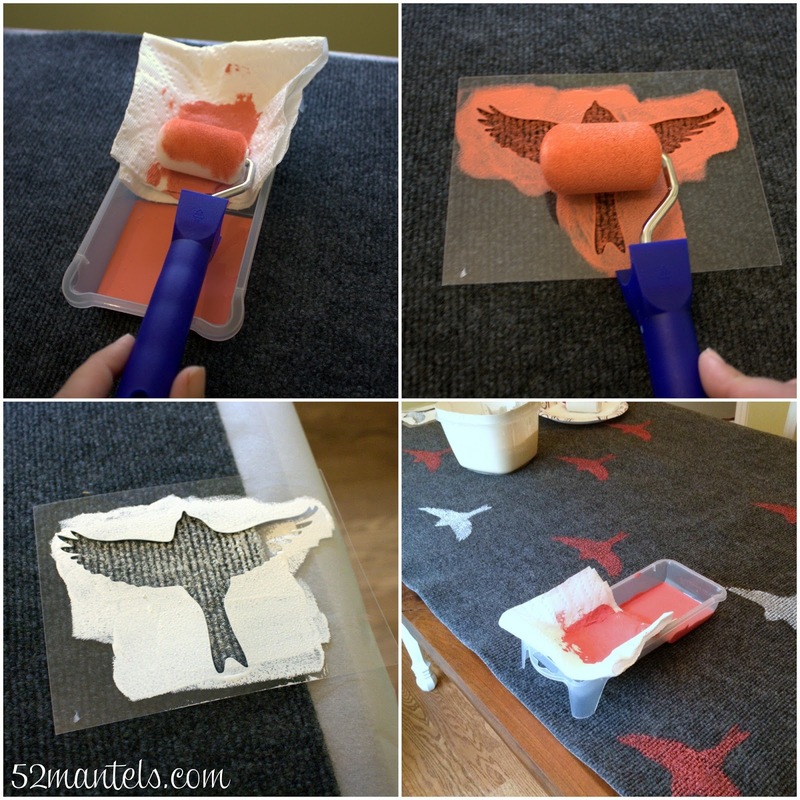 1) Roll your brush in paint and then remove the excess on a paper towel. You don't want your brush overly saturated in paint. 3) Make sure you let some of the birds hang over the edges of the rug. That'll keep the pattern looking random! I used wax paper to protect my table. On a side note, does anyone watch Portlandia? "In Portland, you can put a bird on something and call it art". Looks amazing!! You did a wonderful job!! Hi there! I have an outdoor rug just like this that I wanted to jazz up as well. What kind of paint did you use? ~M. Great question-- I used latex paint (white is Falling Snow by Behr and coral is Sonora Rose by Valspar). My rug is completely covered, so I'm not so worried about the elements. I'll try to update in a couple months and let everyone know how it's holding up! Love your rug. Has it held up to rain or is it always under cover? Our back deck needs a rug something awful as it faces west and gets so hot, can feel the heat under my flipflops. You made it so special with the bird stencil, really love how it looks. I'll have to take a look at HD to see if they have any of those outdoor rugs so I can decorate it for our deck. Wouldn't mind a small one for our front porch also. Both front porch and back deck need painting so a rug would help to hide that. You did such a great job positioning the birds on the rug, it looks perfect, very nice. What a great price also. lOVe your blog and always enjoy your posts. Thanks so much! To be honest, I JUST completed this rug 2 weeks ago. It's held up great for 2 weeks ;). My porch is completely covered. 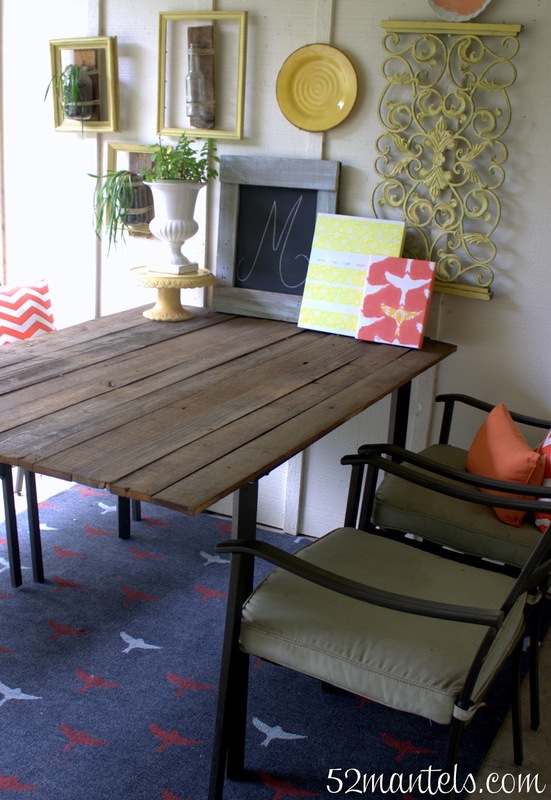 The original rug was $20, so I think it's worth a shot for your deck! Maybe try outdoor paint, if you're worried? But, I've seen lots of blogland people using latex paints for rugs and they seem to hold up fairly well. Definitely let me know what your experience is! I just love it Emily! 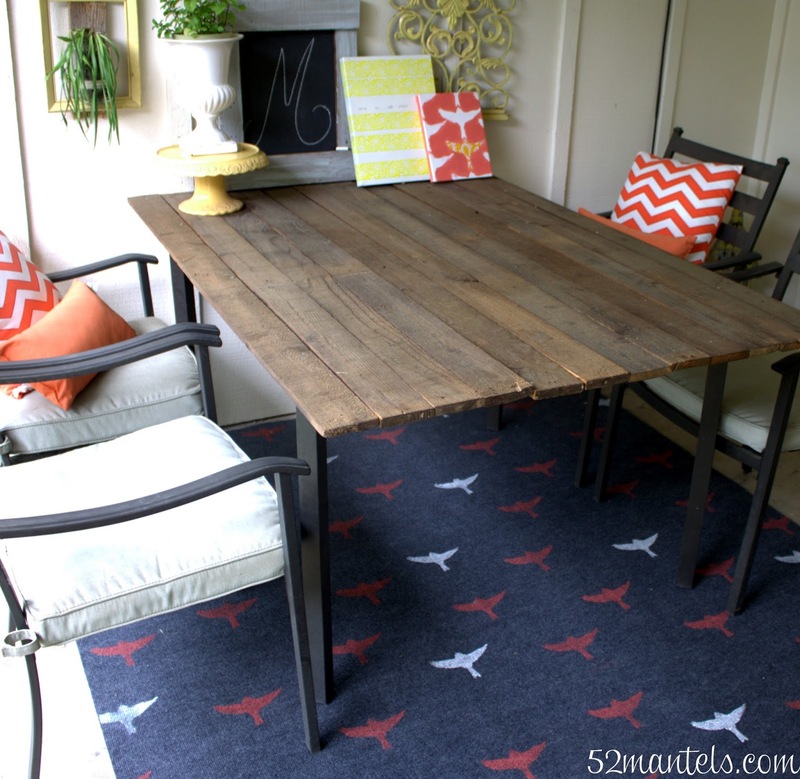 I really need a rug under my outdoor table and just haven't found anything I love. You totally inspired me to try my hand at stenciling a rug. I haven't done that before, but what the heck:) The doorway rug has a key on it, so maybe I will get some key stencils for a big rug. I am hosting a Linky party this weekend and would be super excited if you stopped by to share this awesome post! Thanks so much, Kim! I'll definitely come by! Thanks so much, Heather! Let me know how it turns out! Can't wait to see your wall stencil next week. I have a stencil for my pantry wall that I got from Cutting Edge too! Haven't gotten to the painting yet but curious to see if yours is the same one I have. So pretty, love your space. Your rug looks so nautical! Your outdoor rug turned out so cute Emily!! Put. A. Bird. On. It! LOOOve this and the Portlandia reference! I love this! I think I need to make one for under the Pergola!